17 July, 2007 - Crush and Cramm face down the Guard at Lenin's tomb, and we get a first-ever look at the Planet Bjorgak in Webisode 4 of From Russia With ACTION! Don't miss it! Fortunately, the Savior of the Universe who is prophesized in the Bjorgak tablets which Bjorigosas carried down from the Holy Bjorgak Montain in the year... Well, you get the idea. Watch Webisode 4 to see what all this has to do with Colonel Crush! Anyway, these unexpected events have delayed the release of Webisode 4 until twelve noon PDT on TUESDAY, July 17th. P.S. I've seen it. It's totally worth the wait! Now with Bond Intro Parody! 02 July, 2007 - Well, we've been up all night (literally), but here is the second part to the fourth Crush installment--only about a minute and 4 seconds late. It is a longer episode, so plenty of time to revel in it's awesome. This episode features the original song "From Russia with ACTION!" written by Jon Fairhurst and performed by Jeremy Robeson. It's awesome. Now, I am in desperate need of sleep. 25 June, 2007 - Yes, the Crush film we shot over six months ago is finally making it's debut! After you are done thoroughly enjoying this episode--which may take 10 to 12 viewings, it's a good one--make sure to come back next week, as episodes of Colonel Crush 4 will be released on a weekly basis. That's twice as fast as CC3! And really, you never can have enough Colonel Crush. One More Week Until CC4! 18 June, 2007 - Can you believe it? Only one more week until the debut of Colonel Crush 4: From Russia with ACTION! The film will start with ...wait! I can't spill the beans yet! Until then, enjoy MPHS - an improvised infomercial spoof that didn't quite work, but it's the broken bits that tend to be the funniest. And watch our for those flying desert monkeys! 04 June, 2007 - Big budget network TV shows only produce about 24 shows a year, then they show reruns and specials during the remaining weeks. Rather than have nothing fresh this week, we're showing the proto-microfilm, Minivantastic! We made this long, long ago - before Colonel Crush attacked the Internet. We will highlight some of our older stuff, until June 25th, when we will release Webisode 1 of From Russia With ACTION! Stay tuned! 28 May, 2007 - Yes, Colonel Crush 4 is coming. Starting June 25th we will release a CC4 webisode every week until the end of the installment. Until then, the Crush team is on vacation. 21 May, 2007 - It is here at last! This is one of our craziest films yet: Blazing Broccoli. This is a must watch, so... go watch it! Right now! What are you reading this for!? 14 May, 2007 - We were hoping to get this microfilm out, but alas, it will have to wait until next week. 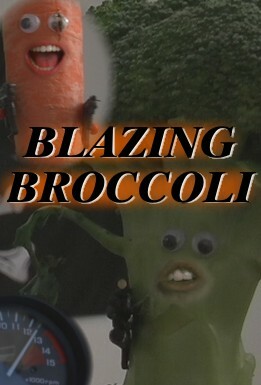 It will be another movie trailer spoof, and as you can see from the poster, vegetables will talk. And if that doesn't get you to click that link, I don't know what will. Anyway, we figured we'd give our fans a week off so they could catch up on all our awesome films like Snakes on a Car, Milk Battle, Colonel Crush 3... the list goes on. So make some popcorn, watch the movies you haven't seen, and then buy a t-shirt. Not kidding. They are awesome and the money goes into new films.